I found myself with a little bit of time yesterday before church and decided to experiment with my blueberries. So I made a Blueberry Clafoutis. I followed this recipe by the "Barefoot Contessa." I thought it might be complicated but in reality it was super simple! Obviously some changes are in order! I used 2 cups blueberries and left out the pear brandy and the creme fraiche. I actually served it cold and it was good! 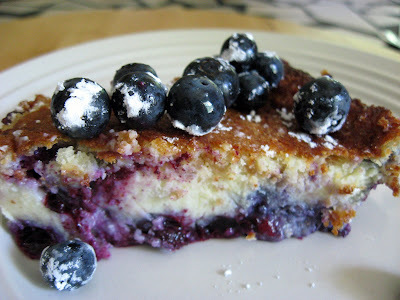 Right before serving I topped the clafoutis with a handful of berries and sprinkled with confectioners sugar. I used a 2 qt Corning Ware dish but this would look really pretty in a decorative, deep pie dish. It needs to be deep though because it gets really fluffy as it bakes and then settles as it cools. You can cover it with aluminum foil after about 20 minutes to keep it from over browning. This was so awesome!! We ate it all yesterday, not a crumb left! So what is a clafoutis? It's like a custard and is not super sweet. The sweetness comes mostly from the berries so if your berries are tart you may want to sprinkle them with a bit of sugar before adding them to the recipe. Feel free to try other berries as well: blackberry, raspberry, strawberry, and maybe even cherry, YUM! I have blueberries waiting to be made into something new! This is perfect! I LOVE blueberries. I LOVE custard! If it will cool down just a bit here, I'll be headed right to the kitchen. Scrumptious! Thanks for sharing.